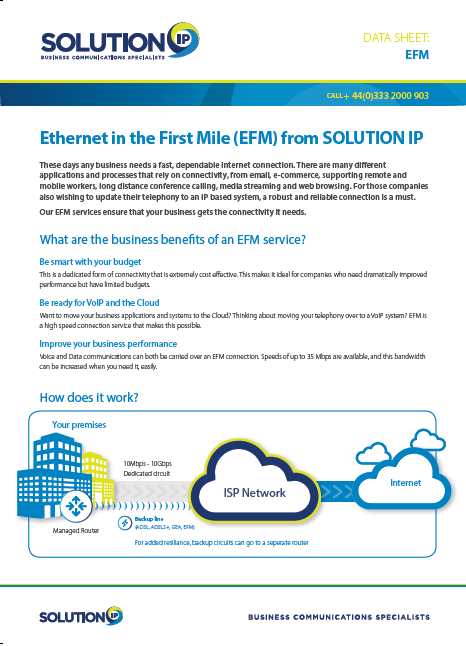 EFM is the ideal solution for those businesses looking for a reliable, uncontended, dedicated connection that is cost-friendly. It uses bundles of copper pairs to deliver a service similar to a dedicated Leased Line, at a much more affordable price. What are the business benefits of an EFM service? This is a dedicated form of connectivity that is extremely cost effective. This makes it ideal for companies who need dramatically improved performance but have limited budgets. Want to move your business applications and systems to the Cloud? Thinking about moving your telephony over to a VoIP system? EFM is a high speed connection service that makes this possible. Voice and Data communications can both be carried over an EFM connection. Speeds of up to 35 Mbps are available, and this bandwidth can be increased when you need it, easily. The solution uses bundles of voice-grade copper pairs to help avoid the bottle-necking that can sometimes occur in the ‘first mile’ of the connection circuit. The number of copper pairs depends on factors such as the distance between your business and the nearest serving exchange. This needn’t worry you- our dedicated experts can talk you through the available options for your company, and make recommendations for which is most suitable to your needs. The benefits of EFM are the speed, 1:1 contention and dedicated nature of the connection. Additionally its possible to get up to 20Mb download speeds. These solutions are quick to install and completely private connections, meaning they are much more secure than other connection types. Lastly, our EFM solutions come with comprehensive SLAs*, meaning that 24/7 support is available in the event of any connection failure, ensuring that there is minimal disruption to business continuity. Interested in an EFM Connection? *Please note: the 100% SLA target is only available where backup connectivity is provided. Fill in the form to download the EFM Factsheet!